Desktop virtualization, otherwise known as Virtual Desktop Infrastructure, (VDI) and utilizes the same core technology as server virtualization. This presents tremendous opportunity for savings in regards to desktop management. This can be achieved either from both Thin Clients or current desktops either at the same office or remotely. Providing the end users with the ability to experience their complete desktop anywhere within their organization. Typically 90-95% of desktop resources remain unused at any given time. Desktop virtualization allows you to separate the desktop operating system and all applications from your desktop computer which can reduce the cost of your PC ownership by 40%. All computing processes take place at the server level which is unseen by the user, but allows them to access all of their necessary files and applications across any connection from any device, including smart phones. VDI solutions help companies to reduce their total cost of ownership, increase business agility and continuity, enable anywhere access, and improve security and compliance. These solutions open an entirely new portfolio of solutions thus empowering companies to choose the technologies that best address their unique technology challenges while protecting their existing IT investments. VDI is the perfect solution for a wide array of work environments ranging from daily internal use, to mobile users across the country. At the same time, the integrity of the user’s data and profile remains protected and secure from outside sources, centrally managed in a data center. Thin clients, which are seen in desktop virtualization, are simple and/or cheap computers that are primarily designed to connect to the network. They may lack significant hard disk storage space, RAM or even processing power. 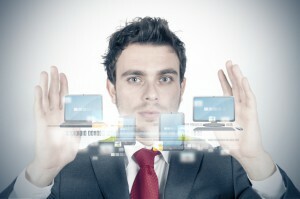 Using Desktop Virtualization allows your company to stay more flexible in an ever changing market. Having Virtual Desktops allows for development to be implemented quicker and more expertly. Proper testing can also be done without the need to disturb the end user. Moving your desktop environment to the cloud also allows for less single points of failure if you allow a third party to control your security and infrastructure.